Marijuana growers historically have turned to cloning to propagate plant inventory and perpetuate plant genetics. But the art of cloning, where a cultivator takes a rooted cutting of a mother plant to grow a genetically identical plant, might slowly be going to the wayside in the cannabis sector. 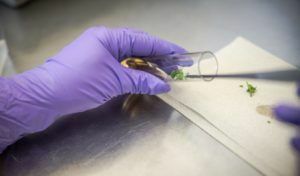 The next big thing for marijuana growers could be tissue culture, which many horticultural experts say is a far better way to propagate and preserve a plant’s genetics. Plant tissue culture – which came to the fore in the 1950s in the orchid industry – is a collection of techniques designed to maintain or grow plant cells, tissues or organs under sterile conditions in culture media, a rich blend of ingredients that promote plant-cell growth. These ingredients can include macronutrients, micronutrients, vitamins, agar and activated charcoal, and they can be blended in-house or found in commercial blends such as Murashige and Skoog. “These techniques are done in Big Ag, the food industry. We’re just adapting what’s already out there,” Hope Jones, CEO of Emergent Cannabis Sciences, told Marijuana Business Magazine. Emergent is a marijuana consulting firm in Phoenix that specializes in tissue culture. No matter the size of a cannabis business, tissue culture is something to consider, proponents told Marijuana Business Magazine. For those considering a move to tissue culture, it’s prudent to conduct a cost-benefit analysis, because setting up a tissue-culture environment requires expertise, time and money. If done correctly, though, an investment in tissue culture can take a cannabis grow to a new level. Work for various business models.